Akrotiri lies 10 km north- east from the Venetian harbour of Hania. Here are the tombs of Eleftherios and Sofoklis Venizelos, the airport of Hania and the port of Souda. Akrotiri is a place for nature lovers, with interesting walking and hiking paths through the unspoilt gorges with amazing diversity, natural beauty and living traditions. Online Travel guide with the best accommodation in Akrotiri. Find the cheapest hotels is Akrotiri & get exclusive online deals. Great rooms at bargain prices. Book online now! Compare Hotel Prices and read Reviews from others. Great Hotel rates and information See photos, reviews & what's nearby Akrotiri . 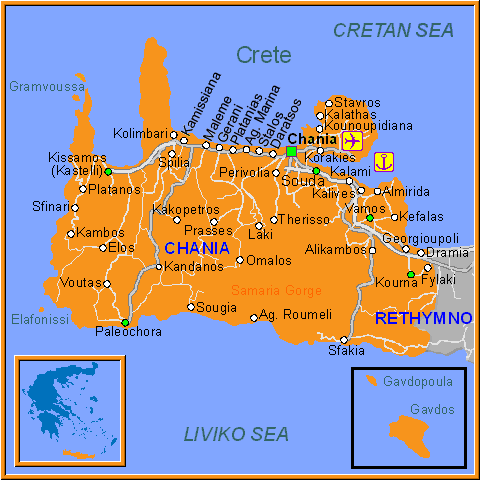 Detailed tourist and travel information about hotels of Akrotiri providing also regional information.